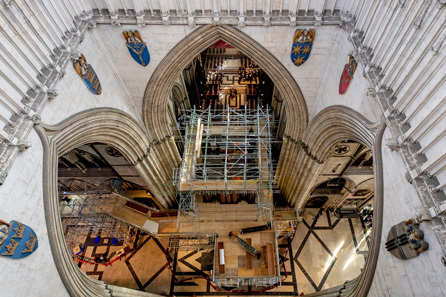 Take a look behind the scenes as specialists remove one of the largest cathedral organs in the country for the first time in more than 100 years. Since 1903, York Minster’s Grand Organ has been at the heart of daily worship at the cathedral. But this constant use combined with the heavy footfall in the Minster which throws up dirt and dust, and the building’s temperature changes and humidity, mean it is now in need of a major refurbishment to ensure its reliability into the next century. The first stage in this two year, £2m project is to completely dismantle the organ, and during October 2018 this mammoth task is being carried out by a team of eight people from organ specialists Harrison and Harrison. The team has been on site since 8 October and during the next three weeks will be carefully removing 5,379 pipes, which range in length from the size of a pencil to 10m long. 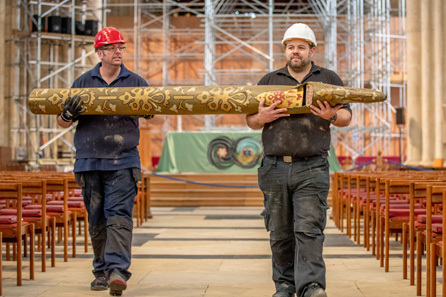 This includes the 100 decorative case pipes which have been silent since the last major refurbishment in 1903 but will be returned to voice as part of the current project. The case pipes date from the early 1830s and have a high lead content, meaning that the soft metal has bent and bowed in places under the weight of the pipes. 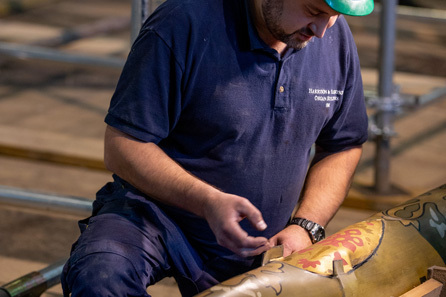 Harrison and Harrison will reshape the pipes and line them with zinc to strengthen the structure, before graining and marbling specialists Robert Woodland and Son clean, repair and restore their decorative surfaces returning them to their original splendour. Other work during the three week period includes removing the enormous organ console and lifting the blowers stored beneath the floor of the North Quire Aisle. 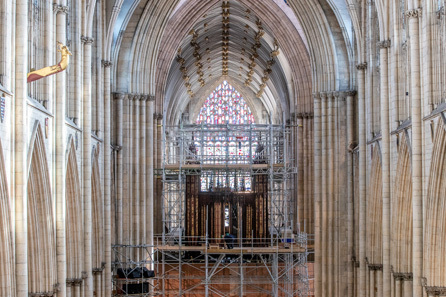 The instrument will be transported to the team’s workshop in Durham for cleaning and repair works to be carried out, before work to reinstall the organ starts in spring 2020. Learn more about the fiery origins of the organ under our Stories section, or to support the project see our donations pages.